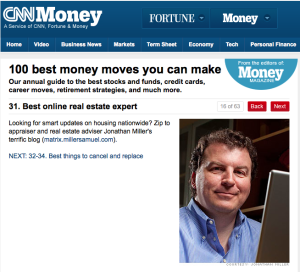 I was flattered to be recognized as Money Magazine’s “Best online real estate expert“. It was part of their “100 best money moves you can make“. Of course it compounds my blogguilt [defined: feeling guilty about not keeping up with your usual blog content flow] since I have been light on posts this month during my gauntlet of market reports. Next week we release our Long Island and Hamptons/North Fork reports and THEN I return to more active blogging (until the Q2 gauntlet hits in July).